The ‘Get to Know Me’ resources aim to support children, along with those around them, who may have additional/special educational needs. They are designed to empower the professionals and adults who support those with identified needs, and encourage empathy and understanding. 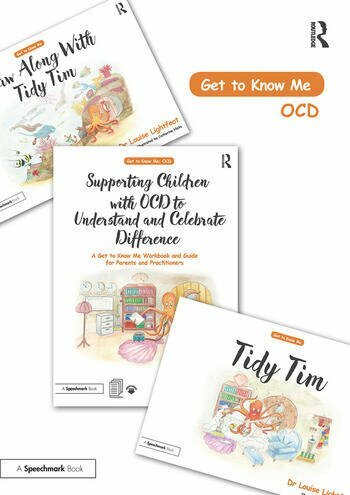 Developed by child psychologist Louise Lightfoot, the Guidebook, Picture book and Draw-along book in this three-part set will help key adults support children with OCD. Practical guidance, tools and strategies are supported by a narrative picture book and a draw-along version, which explore the thoughts, feelings and sensations experienced by many children with OCD. Louise Lightfoot is an Educational and Child Psychologist working with children and young people aged 0-25. She holds a BA in Educational Studies, MA in the Psychology of Education and doctorate in Educational and Child Psychology. Louise has worked in a variety of settings ranging from mainstream schools to secure units and psychiatric facilities, and has a special interest in working to empower at risk or ‘hard to reach’ groups. As a person who suffers with Ehlers Danlos, brain injury and dyslexia, she has a first hand understanding of the frustrations and difficulties that accompany a specific physical or learning difficulty. Catherine Hicks is an East Yorkshire Artist, illustrator, wife & mother. She spent 13 years as a Registered Veterinary Nurse before injury and chronic illnesses lead to her creative hobby becoming therapy. When Catherine and Louise were introduced it was obvious they were kindred spirits and from there the Get to Know Me Series was born.